Lithonia Lighting 65BE Collection LED Downlighting employs 11.9-Watt LED lamp with average life of 35000 hours to deliver light of brightness 687 Lumens. LED Lamp has color rendering index of 82 and color temperature of 3000K. It has voltage rating of 120-Volts and current rating of 0.11-Amp. Downlighting features aluminum spun reflector to significantly reduce glare. It measures 7-5/8-Inch Dia x 2-3/4-Inch. 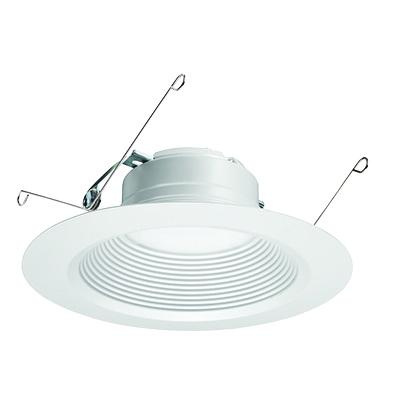 Round LED downlighting in matte white finish, supports recessed mounting. It is ideal for use in multifamily residences, retail shops and offices. Downlight with medium E26 socket, withstands temperature rating of 46 deg C. LED Downlighting is CSA and Energy Star certified.